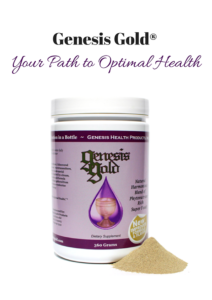 Genesis Gold® has been taken with medications for hypertension, high cholesterol, hormone replacement therapy (including testosterone and estrogen, as well as thyroid, adrenal hormones, and insulin), birth control pills, drugs for diabetes, antibiotics, anti-virals, anti-fungals, anticonvulsants, antidepressants, anti-anxiety drugs with no major reactions. Overtime, many patients on Genesis Gold® can wean off chronic medications as their bodies become biochemically balanced. Always consult with your healthcare provider before adjusting your medications.